There are “downloadable” books and there are “printed” books. You know the difference…… downloadable books/classes/courses are the ones you get immediately upon your payment of the item and have instant access to it. “Printed”, of course, are those books, patterns and so forth that are already printed and are mailed to you. Which do YOU prefer? Some websites, such as SewWithSarah have probably 90-100% of their products as downloadable. SewWithSarah has only two categories that are printed and mailed (the Plus Size Children sewing patterns and the Sewing Machine Repair For The Home Sewer in Spanish), and all other books and classes are downloadable. Some websites, such as SewMachineRepair have only “Print” copies of books, and other sites give you a choice of which version you want. An example of a website offering their book as a download OR print version is 101 Ways To Tie A Scarf – you can read all about the book, then choose which type of book you prefer. Another example would be if you’re thinking about starting a clothing alteration business, or wanting additional information on the subject, you can go to the website, AlterationBiz and once again, read the information and choose whether you want to download it immediately, or go with the print version. We all have reasons for the method we choose. This is the age of “I need it NOW”, so the vast majority of people select the “instant” download of everything. I pretty much agree with that because when I’m in the middle of doing something and am looking for information on that particular subject, I want my information immediately, not a week from now. 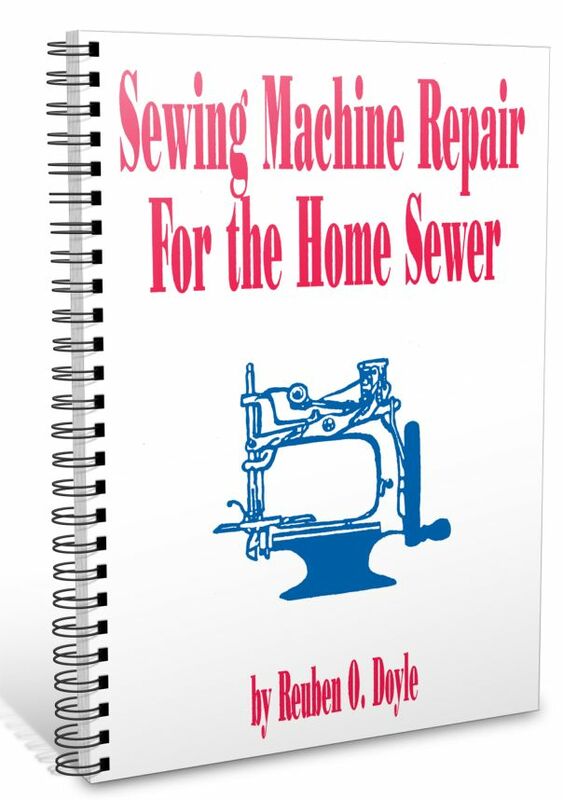 On the other hand, those who buy the print copy of our Sewing Machine Repair For The Home Sewer, or Sewing Machine Repair As A Home Business, say that they want the printed book so they can lay it out beside their machines and follow along with the instructions. Some items, such as craft patterns, crochet or knitting patterns are probably ALL downloadable on every website that carries them. These types of patterns are so easy to download, using just 2-3 pieces of paper, that it just makes sense to go with the instant download on them. Getting ready for spring/summer sewing? Be sure your sewing machines and sergers are in tip top shape so you can get into the sewing projects — you DON’T want to have them in the repair shop! 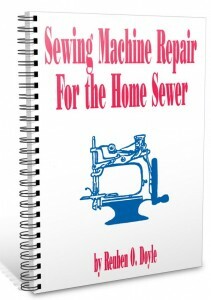 Sewing Machine Repair For The Home Sewer is our all time most popular book! This one book will help keep your machine humming in your sewing room and not in a repair shop. From now through Feb 17, you can grab this book at a 40% discount. Simply use the promo code “sewing” (without the quotes) to get your discount. The Serger Repair for the Home Sewer, Complete Guide to Treadle Sewing Machines and Sewing Machine Repair As A Home Business are all included in the 40% discount – for one week only. Now is a great time to get these books into your sewing room – just in time for spring and summer sewing projects! Again, use the promo code “sewing” (without the quotes) to get your discount. Have you noticed when you’re changing from one project to another the thread all of a sudden starts to loop, get tangled in the bobbin area or other crazy things? The fact is that as you change projects and start sewing on different weight materials, you should test the stitching on a piece of scrap material of the same weight you’re changing to, before beginning the actual project. As an example, if you’re changing from a denim type material to a silky type material, you would definitely want to make sure the tension is correct and the stitching looks right before you start to sew on the new project. 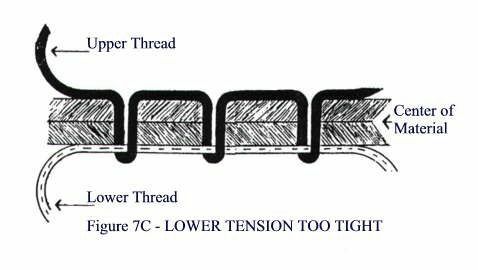 First, be sure you KNOW where the upper tension is located on your sewing machine (check your manual). It can be on the front of the machine, the left side (or end) of the machine, or it could be at the top of the machine, depending on the make and manufacturer of your machine. 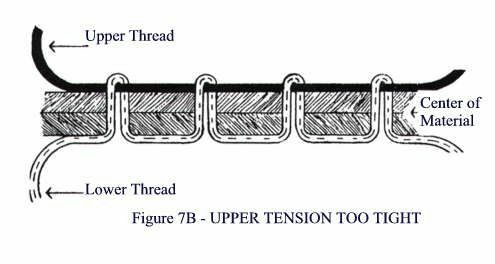 Before attempting to adjust the upper tension, you will need to understand how the upper and lower thread works together to form a stitch and do a test to see if the tension is actually “off” (see Figure 7A, 7B and 7C). The above diagrams show you how the tension SHOULD be and how they would look if there is a problem. To determine whether the upper tension is too tight or too lose for the fabric you want to use, try the following test. Take a small scrap of the fabric, fold it, and stitch a line on the bias of the fabric, using different colors of thread in the bobbin and on top. 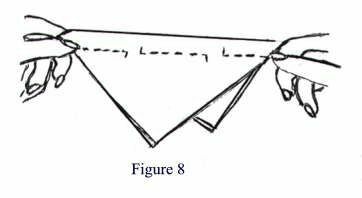 Grasp the bias line of stitching between the thumb and index finger. Space the hands about 3 inches apart and pull with an even, quick force until one thread breaks, as in the following diagram. If the broken thread is the color of the thread in the needle, it means that the upper tension is too tight. If the broken thread is the color of the bobbin thread, the upper tension is too loose. If both threads break together and take more force to break it, then the tensions are balanced. The above sewing machine repair tip is brought to you by Reuben O. Doyle, author of Sewing Machine Repair for the Home Sewer — as well as author of the Complete Guide To Treadle Sewing Machines, Serger Repair for the Home Sewer and Sewing Machine Repair as a Home Business. 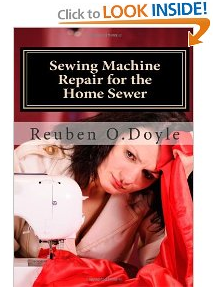 In addition to checking out the Sewing Machine Repair book at SewMachineRepair.com, you can also check it out at Amazon.